Welts (raised areas surrounded by a red base) from hives can appear anywhere on the surface of the skin. Whether the trigger is allergic or not, a complex release of inflammatory mediators, including histamine from cutaneous mast cells, results in fluid leakage from superficial blood vessels. Welts may be pinpoint in size, or several inches in diameter. Hives can also be classified by the purported causative agent. Many different substances in the environment may cause hives, including medications, food and physical agents. In perhaps more than 50% of people with chronic hives of unknown cause, it is due to an autoimmune reaction. Hives including chronic spontaneous hives can be a complication and symptom of a parasitic infection, such as blastocystosis and strongyloidiasis among others. 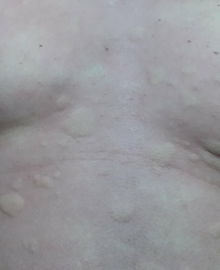 This type of hives can occur right away, precisely after a pressure stimulus or as a deferred response to sustained pressure being enforced to the skin. In the deferred form, the hives only appear after about six hours from the initial application of pressure to the skin. Under normal circumstances, these hives are not the same as those witnessed with most urticariae. Instead, the protrusion in the affected areas is typically more spread out. The hives may last from eight hours to three days. The source of the pressure on the skin can happen from tight fitted clothing, belts, clothing with tough straps, walking, leaning against an object, standing, sitting on a hard surface, etc. The areas of the body most commonly affected are the hands, feet, trunk, abdomen, buttocks, legs and face. Although this appears to be very similar to dermatographism, the cardinal difference is that the swelled skin areas do not become visible quickly and tend to last much longer. This form of the skin disease is, however, rare. The cold type of urticaria is caused by exposure of the skin to extreme cold, damp and windy conditions; it occurs in two forms. The rare form is hereditary and becomes evident as hives all over the body 9 to 18 hours after cold exposure. The common form of cold urticaria demonstrates itself with the rapid onset of hives on the face, neck, or hands after exposure to cold. Cold urticaria is common and lasts for an average of five to six years. The population most affected is young adults, between 18 and 25 years old. Many people with the condition also suffer from dermographism and cholinergic hives. Severe reactions can be seen with exposure to cold water; swimming in cold water is the most common cause of a severe reaction. This can cause a massive discharge of histamine, resulting in low blood pressure, fainting, shock and even loss of life. Cold urticaria is diagnosed by dabbing an ice cube against the skin of the forearm for 1 to 5 minutes. A distinct hive should develop if a patient suffers cold urticaria. This is different from the normal redness that can be seen in people without cold urticaria. Patients with cold urticaria need to learn to protect themselves from a hasty drop in body temperature. Regular antihistamines are not generally efficacious. One particular antihistamine, cyproheptadine (Periactin), has been found to be useful. The tricyclic antidepressant doxepin has been found to be effective blocking agents of histamine. Finally, a medication named ketotifen, which keeps mast cells from discharging histamine, has also been employed with widespread success. The immediate symptoms of this type are treated with antihistamines, epinephrine and airway support. Taking antihistamines prior to exercise may be effective. Ketotifen is acknowledged to stabilise mast cells and prevent histamine release, and has been effective in treating this hives disorder. Avoiding exercise or foods that cause the mentioned symptoms is very important. In particular circumstances, tolerance can be brought on by regular exercise, but this must be under medical supervision. Hives are caused by the release of histamine and other mediators of inflammation (cytokines) from cells in the skin. This process can be the result of an allergic or nonallergic reaction, differing in the eliciting mechanism of histamine release. Over half of all cases of chronic idiopathic hives are the result of an autoimmune trigger. Roughly 50% of patients with chronic urticaria spontaneously develop autoantibodies directed at the receptor FcεRI located on skin mast cells. Chronic stimulation of this receptor leads to chronic hives. Patients often have other autoimmune conditions, such as autoimmune thyroiditis, celiac disease, type 1 diabetes, rheumatoid arthritis, Sjögren's syndrome or systemic lupus erythematosus. Mechanisms other than allergen-antibody interactions are known to cause histamine release from mast cells. Many drugs, for example morphine, can induce direct histamine release not involving any immunoglobulin molecule. Also, a diverse group of signaling substances, called neuropeptides, have been found to be involved in emotionally induced hives. Dominantly inherited cutaneous and neurocutaneous porphyrias (porphyria cutanea tarda, hereditary coproporphyria, variegate porphyria and erythropoietic protoporphyria) have been associated with solar urticaria. The occurrence of drug-induced solar urticaria may be associated with porphyrias. This may be caused by IgG binding, not IgE. This is termed scombroid food poisoning. Ingestion of free histamine released by bacterial decay in fish flesh may result in a rapid-onset, allergic-type symptom complex which includes hives. However, the hives produced by scombroid is reported not to include wheals. Chronic idiopathic hives has been anecdotally linked to stress since the 1940s. A large body of evidence demonstrates an association between this condition and both poor emotional well-being and reduced health-related quality of life. A link between stress and this condition has also been shown. A recent study has demonstrated an association between stressful life events (e.g. bereavement, divorce, etc.) and chronic idiopathic urticaria and also an association between post-traumatic stress and chronic idiopathic hives. The cause of chronic hives can rarely be determined. In some cases regular extensive allergy testing over a long period of time is requested in hopes of getting new insight. No evidence shows regular allergy testing results in identification of a problem or relief for people with chronic hives. Regular allergy testing for people with chronic hives is not recommended. Acute and chronic hives are visually indistinguishable. Angioedema is similar to hives, but in angioedema, the swelling occurs in a lower layer of the dermis than in hives, as well as in the subcutis. This swelling can occur around the mouth, eyes, in the throat, in the abdomen, or in other locations. Hives and angioedema sometimes occur together in response to an allergen, and is a concern in severe cases, as angioedema of the throat can be fatal. The mainstay of therapy for both acute and chronic hives is patient education, avoiding triggers and using antihistamines. Chronic hives can be difficult to treat and lead to significant disability. Unlike the acute form, 50–80% of people with chronic hives have no identifiable triggers. But 50% of people with chronic hives will experience remission within 1 year. Overall, treatment is geared towards symptomatic management. Individuals with chronic hives may need other medications in addition to antihistamines to control symptoms. Patients who experience hives with angioedema require emergency treatment as this is a life-threatening condition. Treatment guidelines for the management of chronic hives have been published. According to the 2014 American practice parameters, treatment involves a step wise approach. Step 1 consists of second generation, H1 receptor blocking antihistamines. Systemic glucocorticoids can also be used for episodes of severe disease but should not be used for long term due to their long list of side effects. Step 2 consists of increasing the dose of the current antihistamine, adding other antihistamines, or adding a leukotriene receptor antagonist such as montelukast. Step 3 consists of adding or replacing the current treatment with hydroxyzine or doxepin. If the individual doesn't respond to steps 1–3 then they are considered to have refractory symptoms. At this point, anti-inflammatory medications (dapsone, sulfasalazine), immunosuppressants (cyclosporin, sirolimus) or other medications like omalizumab can be used. These options are explained in more detail below. Non-sedating antihistamines that block the histamine H1 receptors are the first line of therapy. First generation antihistamines such as diphenhydramine or hydroxyzine block both central and peripheral H1 receptors and can be sedating. Second generation antihistamines such as loratadine, cetirizine, or desloratadine selectively antagonize the peripheral H1 receptors and are less sedating, less anticholinergic, and generally preferred over the first generation antihistamines. People who don’t respond to the maximum dose of H1 antihistamines may benefit from increasing the dose, then to switching to another non-sedating antihistamine, then to adding a leukotriene antagonist, then to using an older antihistamine, then to using systemic steroids and finally to using ciclosporin or omalizumab. H2-receptor antagonists are sometimes used in addition to H1-antagonists to treat urticaria, but there is limited evidence for their efficacy. Oral glucocorticoids are effective in controlling symptoms of chronic hives however they have an extensive list of adverse effects such as adrenal suppression, weight gain, osteoporosis, hyperglycemia, etc. Therefore, their use should be limited to a couple of weeks. In addition, one study found that systemic glucocorticoids combined with antihistamines did not hasten the time to symptom control compared with antihistamines alone. Other options for refractory symptoms of chronic hives include anti-inflammatory medications, omalizumab, and immunosuppressants. Potential anti-inflammatory agents include dapsone, sulfasalazine, and hydroxychloroquine. Dapsone is a sulfone antimicrobial agent and is thought to suppress prostaglandin and leukotriene activity. It is helpful in therapy-refractory cases and is contraindicated in patients with G6PD deficiency. Sulfasalazine, a 5-ASA derivative, is thought to alter adenosine release and inhibit IgE mediated mast cell degranulation, Sulfasalazine is a good option for people with anemia who cannot take dapsone. Hydroxychloroquine is an antimalarial agent that suppresses T lymphocytes. It has a low cost however it takes longer than dapsone or sulfasalazine to work. Omalizumab was approved by the FDA in 2014 for patients 12 years old and above with chronic hives. It is a monoclonal antibody directed against IgE. Significant improvement in pruritus and quality of life was observed in a phase III, multicenter, randomized control trial. Immunosuppressants used for CU include cyclosporine, tacrolimus, sirolimus, and mycophenolate. Calcineurin inhibitors, such as cyclosporine and tacrolimus, inhibit cell responsiveness to mast cell products and inhibit T cell activity. They are preferred by some experts to treat severe symptoms. Sirolimus and mycophenolate have less evidence for their use in the treatment of chronic hives but reports have shown them to be efficacious. Immunosuppressants are generally reserved as the last line of therapy for severe cases due to their potential for serious adverse effects. Afamelanotide is being studied as a hives treatment. Opioid antagonists such as naltrexone have tentative evidence to support their use. The term urticaria was first used by the Scottish physician William Cullen in 1769. It originates from the Latin word urtica, meaning stinging hair or nettle, as the classical presentation follows the contact with a perennial flowering plant Urtica dioica. The history of urticaria dates back to 1000–2000 BC with its reference as a wind-type concealed rash in the book The Yellow Emperor's Inner Classic from Huangdi Neijing. Hippocrates in the 4th century first described urticaria as "knidosis" after the Greek word knido for nettle. The discovery of mast cells by Paul Ehrlich in 1879 brought urticaria and similar conditions under a comprehensive idea of allergic conditions. ^ a b c d "Hives". Archived from the original on 19 August 2016. Retrieved 10 August 2016. ^ a b c d e f g h i j k l m n o p q r s t Jafilan, L; James, C (December 2015). "Urticaria and Allergy-Mediated Conditions". Primary care. 42 (4): 473–83. doi:10.1016/j.pop.2015.08.002. PMID 26612369. ^ a b Zuberbier, Torsten; Grattan, Clive; Maurer, Marcus (2010). Urticaria and Angioedema. Springer Science & Business Media. p. 38. ISBN 9783540790488. Archived from the original on 2016-08-21. ^ a b c Griffiths, Christopher; Barker, Jonathan; Bleiker, Tanya; Chalmers, Robert; Creamer, Daniel (2016). Rook's Textbook of Dermatology, 4 Volume Set (9 ed.). John Wiley & Sons. p. Chapter 42.3. ISBN 9781118441176. ^ A Dictionary of Entomology. CABI. 2011. p. 1430. ISBN 9781845935429. Archived from the original on 2016-08-21. ^ a b Fraser K, Robertson L (Dec 2013). "Chronic urticaria and autoimmunity". Skin Therapy Lett (Review). 18 (7): 5–9. PMID 24305753. Archived from the original on 2016-01-31. ^ "Prescribing Information Dexedrine". GlaxoSmithKline. June 2006. ^ Alexander A. Fisher (2008). Fisher's Contact Dermatitis. PMPH-USA. Archived from the original on 2014-07-05. Retrieved 2014-04-24. ^ Tebbe, Beate; Geilen, Christoph C.; Schulzke, Jörg-Dieter; Bojarski, Christian; Radenhausen, Michael; Orfanos, Constantin E. (1996). "Helicobacter pylori infection and chronic urticaria". Journal of the American Academy of Dermatology. 34 (4): 685–6. doi:10.1016/S0190-9622(96)80086-7. PMID 8601663. ^ Kolkhir, P.; Balakirski, G.; Merk, HF. ; Olisova, O.; Maurer, M. (December 2015). "Chronic spontaneous urticaria and internal parasites – a systematic review". Allergy. doi:10.1111/all.12818. PMID 26648083. ^ Jedele, Kerry B.; Michels, Virginia V. (1991). "Familial dermographism". American Journal of Medical Genetics. 39 (2): 201–3. doi:10.1002/ajmg.1320390216. PMID 2063925. ^ Kontou-Fili, K.; Borici-Mazi, R.; Kapp, A.; Matjevic, L. J.; Mitchel, F. B. (1997). "Physical urticaria: Classification and diagnostic guidelines". Allergy. 52 (5): 504–13. doi:10.1111/j.1398-9995.1997.tb02593.x. PMID 9201361. ^ Moore-Robinson, Miriam; Warin, Robert P. (1968). "Some Clikical Aspects of Cholhstergic Urticaria". British Journal of Dermatology. 80 (12): 794–9. doi:10.1111/j.1365-2133.1968.tb11948.x. PMID 5706797. ^ Hirschmann, J. V.; Lawlor, F; English, JS; Louback, JB; Winkelmann, RK; Greaves, MW (1987). "Cholinergic Urticaria - A Clinical and Histologic Study". Archives of Dermatology. 123 (4): 462–7. doi:10.1001/archderm.1987.01660280064024. PMID 3827277. ^ Nakamizo, S.; Egawa, G.; Miyachi, Y.; Kabashima, K. (2012). "Cholinergic urticaria: Pathogenesis-based categorization and its treatment options". Journal of the European Academy of Dermatology and Venereology. 26 (1): 114–6. doi:10.1111/j.1468-3083.2011.04017.x. PMID 21371134. ^ Bito, Toshinori; Sawada, Yu; Tokura, Yoshiki (2012). "Pathogenesis of Cholinergic Urticaria in Relation to Sweating". Allergology International. 61 (4): 539–44. doi:10.2332/allergolint.12-RAI-0485. PMID 23093795. ^ "Scombroid fish poisoning. DermNet NZ". Dermnetnz.org. 2011-07-01. Archived from the original on 2012-02-04. Retrieved 2012-02-25. ^ Mitchell, John H; Curran, Charles A; Myers, Ruth N (1947). "Some Psychosomatic Aspects of Allergic Diseases". Psychosomatic Medicine. 9 (3): 184–91. PMID 20239792. ^ Uguz, Faruk; Engin, Burhan; Yilmaz, Ertan (2008). "Axis I and Axis II diagnoses in patients with chronic idiopathic urticaria". Journal of Psychosomatic Research. 64 (2): 225–9. doi:10.1016/j.jpsychores.2007.08.006. PMID 18222137. ^ Engin, B; Uguz, F; Yilmaz, E; Ozdemir, M; Mevlitoglu, I (2007). "The levels of depression, anxiety and quality of life in patients with chronic idiopathic urticaria". Journal of the European Academy of Dermatology and Venereology. 22 (1): 36–40. doi:10.1111/j.1468-3083.2007.02324.x. PMID 18181971. ^ Yang, Hsiao-Yu; Sun, Chee-Ching; Wu, Yin-Chang; Wang, Jung-Der (2005). "Stress, Insomnia, and Chronic Idiopathic Urticaria – a Case-Control Study". Journal of the Formosan Medical Association. 104 (4): 254–63. PMID 15909063. Archived from the original on 2017-09-08. ^ Chung, Man Cheung; Symons, Christine; Gilliam, Jane; Kaminski, Edward R. (2010). "Stress, psychiatric co-morbidity and coping in patients with chronic idiopathic urticaria". Psychology & Health. 25 (4): 477–90. doi:10.1080/08870440802530780. PMID 20204926. ^ Chung, Man Cheung; Symons, Christine; Gilliam, Jane; Kaminski, Edward R. (2010). "The relationship between posttraumatic stress disorder, psychiatric comorbidity, and personality traits among patients with chronic idiopathic urticaria". Comprehensive Psychiatry. 51 (1): 55–63. doi:10.1016/j.comppsych.2009.02.005. PMID 19932827. ^ a b Tarbox, James A.; Gutta, Ravi C.; Radojicic, Cristine; Lang, David M. (2011). "Utility of routine laboratory testing in management of chronic urticaria/angioedema". Annals of Allergy, Asthma & Immunology. 107 (3): 239–43. doi:10.1016/j.anai.2011.06.008. PMID 21875543. ^ a b Kozel, Martina M.A. ; Bossuyt, Patrick M.M. ; Mekkes, Jan R.; Bos, Jan D. (2003). "Laboratory tests and identified diagnoses in patients with physical and chronic urticaria and angioedema: A systematic review". Journal of the American Academy of Dermatology. 48 (3): 409–16. doi:10.1067/mjd.2003.142. PMID 12637921. ^ a b James, William; Berger, Timothy; Elston, Dirk (2005). Andrews' Diseases of the Skin: Clinical Dermatology (10th ed.). Saunders. p. 150. ISBN 0-7216-2921-0. ^ Rapini, Ronald P.; Bolognia, Jean L.; Jorizzo, Joseph L. (2007). Dermatology: 2-Volume Set. St. Louis: Mosby. p. 265. ISBN 1-4160-2999-0. ^ Champion, R. H.; Roberts, S. O. B.; Carpenter, R. G.; Roger, J. H. (1969). "Urticaria and Angio-Oedema". British Journal of Dermatology. 81 (8): 588–97. doi:10.1111/j.1365-2133.1969.tb16041.x. PMID 5801331. ^ "Hives (Urticaria and Angioedema)". 2006-03-01. Archived from the original on 2007-08-24. Retrieved 2007-08-24. ^ Kozel MM, Mekkes JR, Bossuyt PM, Bos JD (2001). "Natural course of physical and chronic urticaria and angioedema in 220 patients". J Am Acad Dermatol. 45 (3): 387–391. doi:10.1067/mjd.2001.116217. PMID 11511835. ^ Maurer, M (2013). "Revisions to the international guidelines on the diagnosis and therapy of chronic urticaria". J Dtsch Dermatol Ges: n/a. doi:10.1111/ddg.12194. ^ Bernstein, J (2014). 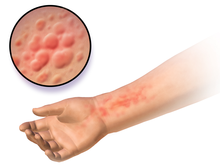 "The diagnosis and management of acute and chronic urticaria: 2014 update". J Allergy Clin Immunol. 133 (5): 1270–1277.e66. doi:10.1016/j.jaci.2014.02.036. ^ a b Zuberbier, T (January 2012). "A Summary of the New International EAACI/GA2LEN/EDF/WAO Guidelines in Urticaria". The World Allergy Organization journal. 5 Suppl 1: S1–5. doi:10.1097/WOX.0b013e3181f13432. PMID 23282889. ^ Sharma, M; Bennett, C; Cohen, SN; Carter, B (14 November 2014). "H1-antihistamines for chronic spontaneous urticaria". The Cochrane Database of Systematic Reviews (11): CD006137. doi:10.1002/14651858.CD006137.pub2. PMID 25397904. ^ Fedorowicz, Zbys; van Zuuren, Esther J; Hu, Nianfang (2012-03-14). "Histamine H2-receptor antagonists for urticaria". Cochrane Database of Systematic Reviews. doi:10.1002/14651858.CD008596.pub2. ISSN 1465-1858. ^ Kim S, Baek S, Shin B, Yoon SY, Park SY, Lee T, Lee YS, Bae YJ, Kwon HS, Cho YS, Moon HB, Kim TB (2013). "Influence of initial treatment modality on long-term control of chronic idiopathic urticaria". PLoS ONE. 8 (7): e69345. doi:10.1371/journal.pone.0069345. PMC 3720657. PMID 23935990. ^ AU Erbagci Z SO (2002). "The leukotriene receptor antagonist montelukast in the treatment of chronic idiopathic urticaria: a single-blind, placebo-controlled, crossover clinical study". J Allergy Clin Immunol. 110 (3): 484–488. doi:10.1067/mai.2002.126676. PMID 12209099. ^ Pacor ML, Di Lorenzo G, Corrocher R (2001). "Efficacy of leukotriene receptor antagonist in chronic urticaria. A double-blind, placebo-controlled comparison of treatment with montelukast and cetirizine in patients with chronic urticaria with intolerance to food additive and/or acetylsalicylic acid". Clin Exp Allergy. 31 (10): 1607–1614. doi:10.1046/j.1365-2222.2001.01189.x. PMID 11678862. ^ Boehm I, et al. (Jul 1999). "Urticaria treated with dapsone". Allergy. 54 (7): 765–6. doi:10.1034/j.1398-9995.1999.00187.x. PMID 10442538. ^ Maurer, Marcus; Rosén, Karin; Hsieh, Hsin-Ju; Saini, Sarbjit; Grattan, Clive; Gimenéz-Arnau, Ana; Agarwal, Sunil; Doyle, Ramona; Canvin, Janice; Kaplan, Allen; Casale, Thomas (2013). "Omalizumab for the Treatment of Chronic Idiopathic or Spontaneous Urticaria". New England Journal of Medicine. 368 (10): 924–35. doi:10.1056/NEJMoa1215372. PMID 23432142. ^ Kaplan AP (2009). "What the first 10,000 patients with chronic urticaria have taught me: a personal journey". J Allergy Clin Immunol. 123 (3): 713–717. doi:10.1016/j.jaci.2008.10.050. PMID 19081615. ^ Morgan M (2009). "Treatment of refractory chronic urticaria with sirolimus". Arch Dermatol. 145 (6): 637. doi:10.1001/archdermatol.2009.13. PMID 19528416. ^ AU Shahar E, Bergman R, Guttman-Yassky E, Pollack S (2006). "Treatment of severe chronic idiopathic urticaria with oral mycophenolate mofetil in patients not responding to antihistamines and/or corticosteroids". SO Int J Dermatol. 45 (10): 1224–1227. doi:10.1111/j.1365-4632.2006.02655.x. ^ Langan, EA; Nie, Z; Rhodes, LE (Sep 2010). "Melanotropic peptides: more than just 'Barbie drugs' and 'sun-tan jabs'?". The British Journal of Dermatology. 163 (3): 451–5. doi:10.1111/j.1365-2133.2010.09891.x. PMID 20545686. ^ Phan, NQ; Bernhard, JD; Luger, TA; Ständer, S (October 2010). "Antipruritic treatment with systemic μ-opioid receptor antagonists: a review". Journal of the American Academy of Dermatology. 63 (4): 680–8. doi:10.1016/j.jaad.2009.08.052. PMID 20462660. ^ Volcheck, Gerald W. (2009) Clinical Allergy Diagnosis and Management. London: Springer. ^ Poonawalla T, Kelly B (2009). "Urticaria : A review". American Journal of Clinical Dermatology. 10 (1): 9–21. doi:10.2165/0128071-200910010-00002. PMID 19170406. ^ McGovern TW, Barkley TM (2000). The electronic textbook of Dermatology. New York: Internet Dermatology Society. ^ Juhlin L. (2000) The history of Urticaria and Angioedema. Department of Dermatology, University Hospital, Uppsala, Sweden. ESHDV Special Annual Lecture.